Maiko Haaaan!!! was released this past Tuesday by Viz Media. I watched it yesterday (Wednesday), but I hesitated writing a short review about it because I didn’t know how I felt about the movie. Maiko Haaaan!!! 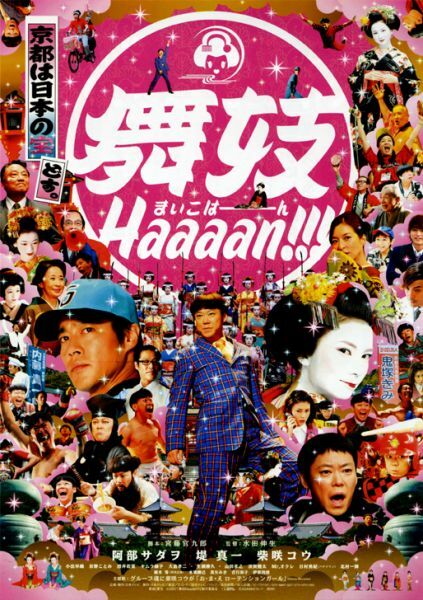 is a comedy about Kumihiko (Sadao Abe) who is your ordinary salaryman for a Cup-Ramen company in Tokyo. He runs a Maiko BBS and is obsessed with meeting a Maiko (an apprentice Geisha). Earlier in his childhood, he got lost on a class trip to Kyoto and discovered the Maiko. He decides to leave Tokyo and head to Kyoto to make his childhood dreams of meeting a Maiko come true. Along the way, Kumihiko faces many obstacles. Will they stop him from playing strip baseball with the Maiko? While the story was funny, Kumihiko as a character annoyed me for the entire movie. Yes, I know it was a movie, but obsessive people get on my nerves, fake or not. Someone with a strong determination usually inspires, but Kumihiko annoyed. Sadao Abe played that character well. Maybe too well! Would I recommend watching Maiko Haaaan!!!? Sure. Besides Kumihiko as a character, this movie has everything. While it has that silly slap-stick sort of comedy, it does tackle life’s relationship problems as well. The overall theme of the film is: What one person will do for the love of another, even if that person doesn’t realize it. For that, it’s a good movie. Plus, Namase Katsuhisa (middle) is in it. He’s one of the funniest Japanese actors out right now. You may remember him as the vice principal/head teacher from Gokusen. Check out Maiko Haaaan!!! at Amazon, and here’s a trailer.